Vladimir Guerrero, Jr. is the “face” of the Toronto Blue Jays. He has also yet to play even a single game in the majors. How does this happen? Well, while some might say that the transition to Vlad Jr. has been going on for the last two years, the 2018-to-2019 offseason sealed the deal: we have officially entered the time period between the last good Blue Jays team and the next good Blue Jays team. There’s no spending (or trading) their way to avoid a rebuild, and there’s little connection to the previous glory on the current roster – it’s a fairly clean split. The faces of their back-to-back American League Championship Series teams in 2015 and 2016 have departed in the last three seasons. Jose Bautista and Edwin Encarnacion had already departed before 2018, and the transition mostly finished with the trade of Russell Martin to the Dodgers, release of Troy Tulowitzky (now a Yankee) and loss of Josh Donaldson (traded to Cleveland at last season’s deadline). Those who remain include Marcus Stroman, who had a disaster of a 2018 season; Devon Travis, who had a 77 wRC+ last year; Justin Smoak, a decent if uninspiring first baseman; and Kevin Pillar, who remains a defensive whiz good for two WAR per-season but only once ended significantly higher. 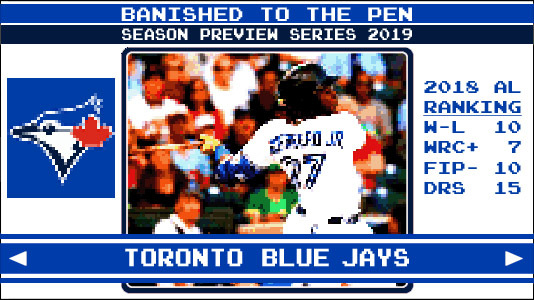 As the consensus Top Prospect In Baseball ™ who has already had success in AAA and is ticketed for a 2019 major league debut, he’s putting his claim on the (admittedly arbitrary and PR-driven) mantle of the Face Of The Jays. That’s partly because of the void on the big club roster, and partly because he’s so far ahead of the rest of the farm. He’s already projected to be the most valuable player by WARP on the Blue Jays, and when you hit .381/.437/.636 across AA and AAA AND when you’re the son of a hall-of-famer, people will take notice more than the usual prospect. That said, he’s not arriving to the bigs by himself: catcher Danny Jansen (115 wRC+ as a September call up last season), infielder Lourdes Gurriel Jr. (103 wRC+), outfielder Billy McKinney (112 wRC+) and Sean Reid-Foley (4.21 xFIP), all made their debuts in 2018 and will look for growth in the upcoming season. There’s also Bo Bichette and Cavan Biggio, two other sons-of-big-leaguers rising quickly through the ranks. Nate Pearson, a pitcher who has landed in the top half of multiple top-100 lists, will also be a big part of the team’s future. None of these players reach the same stratosphere as Guerrero, however. Vlad Jr. by himself lifts what would otherwise be a decent farm system into being one of the best in baseball (and within the top-5 by Baseball Prospectus), so surely you can dream on him lifting a pedestrian major league club into something much more. With Vlad Jr. out on account of a strained oblique muscle (which ended up being a convenient cover-up for service time manipulation), the first few weeks of Blue Jays baseball could be difficult to watch. But Vlad’s arrival will bring instant attention to Toronto and signal a turning point for the organization and the start of his service clock. The Jays won’t be winning any pennants with Guerrero in AAA or on the IL — online baseball publications haven’t yet started awarding flags for the top farm system, and each one mentions that major league wins and accomplishments are paramount over farm ranking. The Blue Jays will soon be cashing in on their ranking, with Guerrero leading the way as the Face of the Franchise, just don’t expect the payoff to come in the form of wins in 2019 (spoiler: it probably won’t happen in 2020 either). What is the Blue Jays’ most recent accomplishment? The Blue Jays were far-and-away the worst baserunning team in 2018 according to FanGraphs, but that’s not a fun answer. The real answer to the Blue Jays’ most recent accomplishment is that they hired Carson Cistulli to be a part of their organization. I’m anxiously awaiting the moment when the Jays start collecting former Fringe Five players off the waiver wire. How will the Blue Jays define success in 2019? Growth and rebound years from the players who will be on the next Blue Jays playoff contending team. This includes Vlad Jr. showing some flashes in the majors. The most Effectively Wild player on the Blue Jays: Vladimir Guerrero, Jr. While he might not have reached Ronald Acuna or Yoan Moncada levels in terms of podcast banter, he’s still had his share. In episode 1260 it was discussed whether he should have been promoted during the 2018 season; in episode 1296 Ben and Jeff ( 🙁 ) were joined by Craig Edwards and Eric Longenhagen to talk about prospect value, and Vlad was worth double Fernando Tatis Jr. who is number two on the list; and most recently, in episode 1346 Ben and Sam bantered about Vlad’s oblique injury and whether it’s “good” or “bad” for the Blue Jays in light of the service time conversations that would have come up when they would otherwise have demoted him to AAA. Honorable mention goes to Fringe Five alum and Cistulli favorite Cavan Biggio, who now ranks number 12 on the Blue Jays organizational list at FanGraphs.